Agriculture is the greatest consumer of antibiotics in the world, but consumers are pushing for antibiotic-free meat. Though still a niche in the food market, increasing consumer awareness especially in the US and Europe is – in some places supported by government – paving the way for a growing market in antibiotic-free food. In China and India, use of antibiotics is expected to rise, but a growing concern over environmental and health issues can create a drive for greater demand for antibiotic-free food. Estimates suggest that up to 80 percent of the antibiotics sold in the US are used in agriculture, and globally the use of antibiotics in agriculture is estimated to increase by 67 percent between 2010 and 2030. Much of the increase is expected in China, India, and other growing economies where a booming middle class will raise demand for meat. Antibiotics are used in agriculture to not only treat illness in animals but also to make animals grow faster and to prevent illnesses that occur frequently under unhealthy growth conditions. Supermarkets are starting to develop policies and positions on the use of antibiotics in the meat they source. Some are already offering several kinds of antibiotic-free meat to customers; others have made clear position statements while others are only just starting the conversation internally on this rising sustainability issue. In the US, antibiotic free meat is still a niche of approximately just 5 percent of the sales, but it is growing fast in an otherwise shrinking market. Especially sales of antibiotic-free chicken are booming, with 34 percent growth in 2014. A number of fast food chains have committed to serving antibiotic-free chicken meals within a few years and digital tools already exist to guide consumers to restaurants offering antibiotic-free meals. A recent World Health Organization (WHO) global action plan to combat antibiotic resistance will further raise awareness of this opportunity by requiring all countries to develop national action plans. Bringing down the overuse of antibiotics in agriculture will be an important milestone in many of these national plans, which means less antibiotics leak into the environment from farms. In all, the growing consumer demand for antibiotic-free food combined with political pressure for reducing the use of antibiotics represents a unique challenge and opportunity for the entire meat value chain. Antibiotic-free chicken production is the lowest hanging fruit in the antibiotic free meat market. Short production cycles make disease control in chicken production less complicated than for other forms of livestock. For other meat products, fully eliminating the use of antibiotics is more complicated. However, pilot projects to test production methodologies and market potential are starting to appear. The development of a new set of global standards to certify meat products produced without or with responsible use of antibiotics will further fuel this opportunity. Clear labels of ‘raised without antibiotics’ or meat produced with ‘responsible use of antibiotics’, will give consumers the tools to shop antibiotic-free meat more confidently. Less antibiotics on our farms means fewer resistant bacteria in our surroundings. Antibiotic-free food is a relatively new phenomenon. It currently accounts for a small segment of the overall meat market but the demand is increasing. It is expected that most countries will develop national action plans to combat antibiotic resistance that can be expected to influence the future demand for antibiotic-free food. 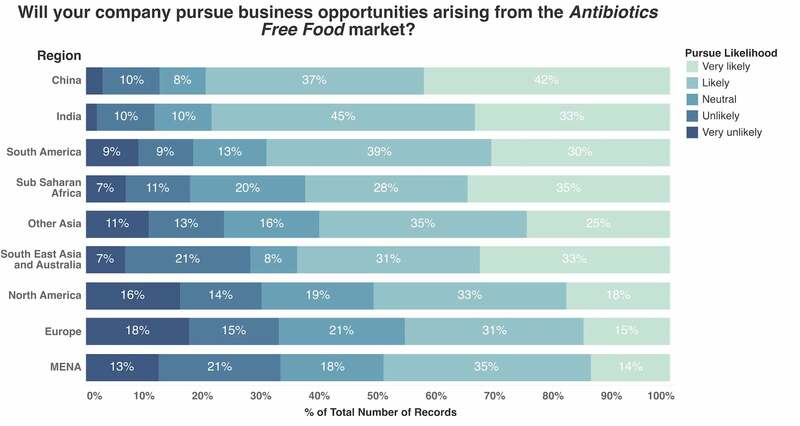 Antibiotic free food is a market opportunity favored by the Other Asia region pointing to possibilities for pursuing new business in this emerging market space. Globally, the finance sector is the most positive of all business sectors. Among all business sectors surveyed, it is the manufacturing sector which perceives to be most affected by this market opportunity when compared to the other presented markets in our 2015 survey. However, manufacturing along with the other business sectors have not responded more positively towards pursuing this market opportunity over others. This could imply that the market opportunity is not mature enough for mainstream business. Growing demand from consumers and maturation of the concept could boost this market’s capacity to attract the interest of business sectors. MENA stands out as a region that neither sees societal benefit nor has the capacity to pursue the market opportunity of antibiotic-free food. The low capacity is mainly explained by a very low degree of perceived political will power in the region on this issue. Likewise, for North America, political will power, as a capacity factor, scores relatively low which results in an overall capacity score lower than some of the other regions. 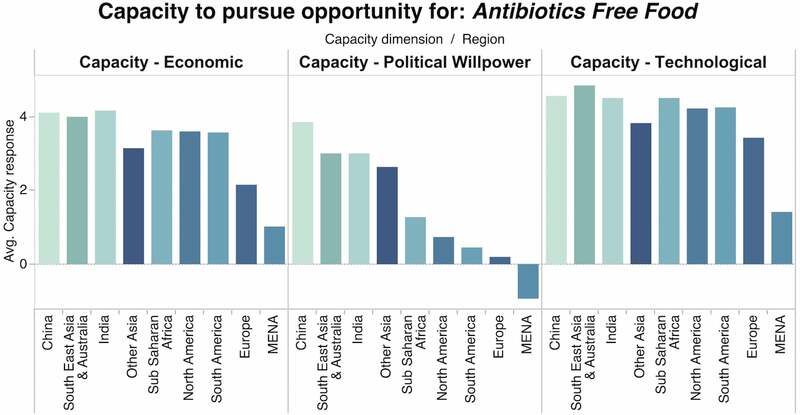 Europe also rates the capacity to pursue antibiotic free food relatively low and mainly due to relatively low scores on economic capacity and political will power. Shifting from current production methods in Europe to antibiotic-free livestock production will mean lower productivity pushing up production costs, which may explain the perceived low levels of economic capacity to pursue this opportunity. At a general level our 2015 survey expresses that, antibiotic-free food is perceived to be good for society but there seems to be capacity gaps in pursuing it. The data points to the fact that both civil society and business are likely to advocate for this opportunity, which may count in favor of building powerful alliances in making a change happen. This market was surveyed globally in 2015 by more than 5500 leaders from both the public and private sectors. The survey was conducted in collaboration with the research company YouGov. The survey results were originally published in the Global Opportunity Report 2016.